Four people including three Rohingyas have been killed in a road accident in Balukhali area at Ukhiya upazila, Cox’s Bazar. 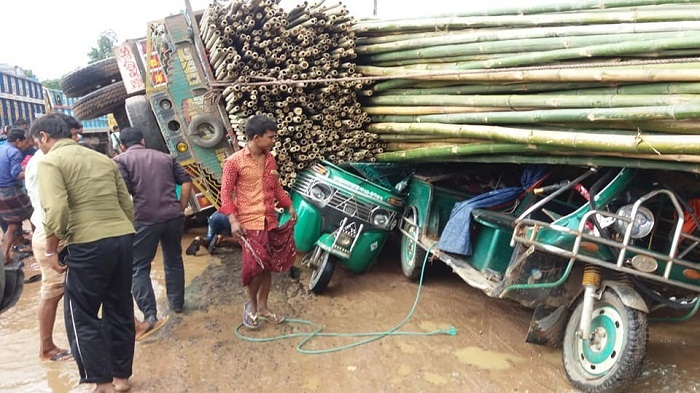 The tragic incident took place after a bamboo-laden truck losing control crashed on its side, and crushed two auto-rickshaws while letting a bus overtake it around 10:30am on Monday, Ukhiya police station OC Md Khairuzzaman said. Four people – three Rohingyas and one local – died on the spot, he said. The Rohingyas were identified as Nur Kayes, 25, a resident of Balukhali refugee camp, Tasrin Aktar, 20, and her 27-day-old daughter Mosharefa Aktar, both from Teknaf’s Leda Ali Khali refugee camp. The fourth victim was Rozina Aktar, 23, of Balukhali’s Panbazar. She used to work for nongovernmental organization Mukti at Balukhali camp. Police said the bodies of the deceased were later handed over to their families.